Women will be at the forefront of any genuine social revolution and women’s involvement in the Rojava revolution is certainly striking. But disillusioned Stalinists have often used feminism as an excuse to abandon class politics. Indeed the leaders of the PKK say that ‘the liberation of women is more valuable and meaningful that the liberation of classes’ and the PKK’s patriarch, Abdullah Ocalan, argues that the class war ‘has come to an end’. One PKK/PYD police chief has claimed that the Rojavan police intend to eventually eliminate themselves. But modern policing was originally invented in the 1800s to impose private property and wage labour. Surely it can only be eliminated by completely abolishing both property and wage labour? Inmates of a Rojava prison. In some contrast to the police chief’s radical claim, there are many other claims of violent repression by the PKK/PYD police. Are these claims all just anti-PKK propaganda? There are also claims that many ‘popular’ organisations in Rojava are fronts for the PKK/PYD who, along with their militias, hold much of the real power. Even if these claims are exaggerated, how can local popular assemblies with almost no resources have any real power unless they start socialising or communising more private property? Unfortunately, the economic revolution in Rojava has been rather modest so far. An economics minister has said that: ‘With the beginning of the revolution … it was even forbidden to break open a cash box’. He also said that he wanted any coops to compete with private capital. 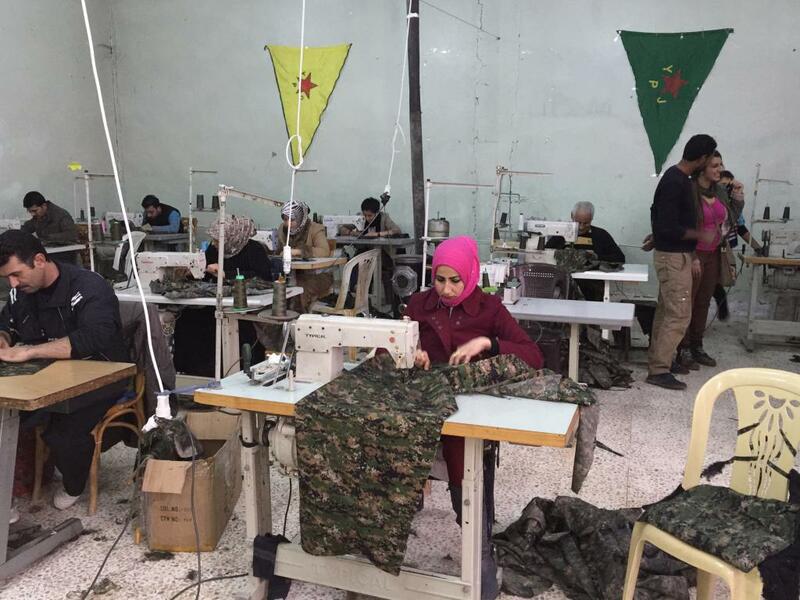 In this situation, how is wage labour in Rojava’s coops any less alienating or miserable than any other work in capitalist society? PKK/PYD leader, Salih Muslim, meeting with US ‘neocon’ Zalmay Khalilzad. Exactly 100 years ago, most of Europe’s leftists were supporting either side in the First World War on the grounds that they were somehow fighting for democracy and socialism. Since then leftists have taken sides in virtually every inter-imperialist war for similar reasons. After tens of millions of deaths, and little success in overthrowing capitalism, shouldn’t we be looking for a better way forward than taking sides in barbaric inter-imperialist wars? Whatever the correct answers to all these questions, many people in Rojava are genuinely trying to transform society in very difficult circumstances. We certainly need to oppose the embargo of Rojava and to demand open borders for all refugees. But surely our priority must be working out how revolution might happen here in the West – a revolution which would be a vital complement to any successful revolution in the Middle East. 1. In an uncanny parallel to Biehl and Graeber’s visit, Steffens visited the Soviet Union at the same time as a US government delegation – although at least Biehl and Graeber went on a separate delegations! Lincoln Steffens - Spartacus Educational. 2. 'New Year Message from the KCK', 31/12/14; A.Ozcan, ‘Turkey’s Kurds’ p204-6. 3. Becky/SIC, 'Starting from the Moment of Coercion'; Zaher Baher, 'The Experiment of West Kurdistan', libcom.org. 4. 'PYD Rounds up Conscripts', Rudaw.net 12/10/14. Back in the 1980s many leftists were very impressed by the fact that a militia, this time ran by the Sandinistas, was 30% female. Unfortunately, these leftists completely underestimated the consequences of the Nicaraguan revolution’s failure to abolish private property. The subsequent betrayal of women by the Sandinistas is exemplified by the fact that the present Sandinista government has imposed anti-abortion laws that are even stricter than those of the pre-revolutionary Somoza dictatorship. ‘The Guardian’, 29/7/09. 5. PKK Online; P.J.White, ‘Primitive Rebels Or Revolutionary Modernizers?’ p143-8; J.Tejel, ‘Syria’s Kurds’ p75-9, 92-5, 137. 6. H.Tahiri, ‘The Structure of Kurdish Society’ p223-4; M.Gunter, ‘Out of Nowhere?’ p176. 7. Kurdwatch interview with Salih Muslim, 8/11/11; J.Biehl, 'Impressions of Rojava', roarmag.org. 8. D.Graeber, ‘No. This Is a Genuine Revolution,’ libcom.org. 9. ‘Middle East Report’ no.151, International Crisis Group website; H.Allsopp, ‘The Kurds of Syria’ p202-9; KURDWATCH.ORG, especially 'Report no.9'. 11. Rudaw.net, 9/12/14; A.Cockburn, 'Harpers Magazine', 12/6/14. 12. H.Hassan, 'The Guardian', 28/9/14; D.Postel, 'Should We Oppose the Intervention Against ISIS? ', 'In These Times' 18/24/14; E.Babacan, ‘False Friends of Kobane’, jacobinmag.com. See the libcom.org 'Rojava revolution' reading guide for sources and more readings. Indeed the leaders of the PKK say that ‘the liberation of women is more valuable and meaningful that the liberation of classes’ and the PKK’s patriarch, Abdullah Ocalan, argues that the class war ‘has come to an end’. 2) Why you make selective quoting, is it because it is easier to frame him? His full quote on women's liberation is this: "KCK said the liberation of women is more valuable and meaningful than the liberation of classes and nations" why you omit nations while quoting? I mean of course this can be debated, but the obvious idea here is this Women's liberation is going good and is at critical importance in kurdish ranks. What is so wrong about saying that? Is there any women’s movement in Rojava that is genuinely independent of the largely middle class leadership of the PKK/PYD? Female military recruitment failed to lead to long-term women’s liberation in other nationalist uprisings such as the Sandinista revolution. Why should it succeed in Rojava? Source? and with full context please... Because you are just saying Ocalan says: people see him like prophet ( and well factually it is probably true), so maybe after that sentence he can say: this is not so I mean you already made a misquotation in first paragraph so I wish to ask for source. So how can the Rojavan proletariat break from the Ocalan personality cult? In some contrast to the police chief’s radical claim, there are many other claims of violent repression by the PKK/PYD police. Are these claims all just anti-PKK propaganda? No I do not think so. I do not think YPG threats very democratically protestors. Even if these claims are exaggerated, how can local popular assemblies with almost no resources have any real power unless they start socialising or communising more private property? I do not get it? you think PYD somehow stops people from communalizing? Any concrete examples? Also lets get real for a minute: What are these local communites? Are not they also connected to PYD byt link of TEV-DEM and DSA? The other side of political conflict in Rojava was a bunch of Barzani parties, they do not want local assemblies etc... They just recently agreed be with PYD and (also) become parts of local government. Barzani supporters neither want direct democracy nor communalization (and they are like at least 33% of population) so who you want to communalize private property? Should PYD do it by force of YPG? Unfortunately, the economic revolution in Rojava has been rather modest so far. Again, what do you want? Make up your mind, please. Should they take the property of people causing more distress and protest and consequently more human right violations? In this situation, how is wage labour in Rojava’s coops any less alienating or miserable than any other work in capitalist society? I think, there is a huge possibility ultimately it won't. However, again this question arises: Are communists can justifiably only support immediate abolishing of private property? nad they can not any other thing? For example: democratization of economic life and politics (in the sense of worker cooperatives, direct democracy, social control over economic life etc...) from when on started to be considered as taboo issues for communists. Well historically it was not. Despite all possible problems that might emerge (integration to capitalist market) such liberating and communalizing reforms and tendencies can and should be supported by communists ( I am not even discussing the danger of IS on Rojava). As they can prepare the ground for future communalist "subjects" to emerge. Do not get me wrong I totally get the argument "I do not want to support anything that might be another market economy" However what kurdish movement proposes is not exactly a copy of western democracy and market, but a system more progressive than that. And in this political conjuncture where in libcom we are discussing "will IWW resurrect again?" I think it is a very very good option to support. A new Arab Spring is desperately needed to overthrow both ISIS and their Saudi, Gulf State and Turkish backers. How can the Rojava revolution, with its ‘radical Kurdish identity’ and its bizarre semi-religious cult around Ocalan, ever inspire the majority of Arabs? I do not believe Arab spring has any answers to IS. Moreover I do not get it, why Kurds need to inspire Arabs? ( I mean how do we even know such project is realizable now?) Also kurds just want propose to build autonomy based on multi-cultural federations, if Arabs currently do not like this idea well I think it is their problem. However the real political process seems to be developing for better for Kurds. As "free Syrian Army" originally did not invited Kurds for meetings for future of Syria (but invited USA, Turkey etc...) Now the next meeting appears to be include Kurds.So from the Kurds side it is good. Maybe if Arabs are open to debate they can find good political lessons in Kurdish political project. Surely only a revolution that offers the prospect of sharing and communising ALL the private and state capital of the Arab world (i.e. its vast oil wealth) could begin to compete with the appeal of Islam? I think this is just pure fiction. You just say well if x has happened it will be remedy to all of our problems. However apparently x has no existence at all. I think this is bad form of revolutionary theorizing. what is needed is to translate the communism for todays Arabs, just as Kurdish movement is doing for years for kurds. Unable to inspire revolution across the Arab world, the PKK/PYD have instead chosen to ally with the US. Come on: Who says they wanted to do it? First of all they declared from they one they do not want to fight with anybody! Not Arabs, not Assad, not IS etc... Which nobody liked (except Assad maybe as he was in a weak position) And what is your alternative should they ally themselves with Assad?, IS? or the proleteriat-to-come? Also I do not get this: why do you try to imply all the time: Arabs are anti-US, Kurds are pro-US, well the results of Arab Spring does not support it. If we believe your description, there was already an anti-US social bound between all ethnicities but Kurds just break it ethnically and politically and just go pro- US, is it a realistic picture of actual conditions? But won’t this alliance just encourage more Arabs to distrust Kurds and to join ISIS? Won’t it push the region even further into an inter-imperialist bloodbath? Well this is their problem. Because Kurds did not attack anybody and wish to end the war, unlike IS. From when on Kurds become responsible for bloodbath in region? Again you do not know what you are talking about. Barzani is already supported in Rojava. Moreover their invitation is not just based on US, it is a kurdish social issue. what do you want them to do? Should they ban every other party except themselves? You get the frame wrong. Exactly 100 years ago, most of Europe’s leftists were supporting either side in the First World War on the grounds that they were somehow fighting for democracy and socialism.After tens of millions of deaths, and little success in overthrowing capitalism, shouldn’t we be looking for a better way forward than taking sides in barbaric inter-imperialist wars? Unfortunately nobody wants to believe but Kurdish movement is not socialist or national liberationist. They made critique of those they have their own model (which you should learn) and I think they have every right to give it a shot. Of course they will propably not manage to realize a millenial change but I think they would provide good and bad examples to formulate the question of communism today (and especially in a non-eurocentric way). I totally agree with this last paragraph. However I do not get it why do you try to make anti-propaganda in the first paragraph based on wrong quotations and biased opinions on later ones, and then you come to write such a paragraph. I can not make sense of it. In agreement with kurrem on most points he/she has raised above. Further, this post is of the type of the all too typical defeatist "all or nothing" no-compromise stance wherein said movement can only be supported (even while exhibiting libertarian elements) if photos of Kropotkin or Zerzan are noticeably positioned on the walls, and the CNT colors chosen as official flag. Movements have nuances that must be respected, while respectfully critiqued, of course. Remember some of the cynical disparagement that shoveled forth from some mouths upon the rebellion in Chiapas. I think if there were photos of Zerzan positioned on the wall, there would only be ridicule... That guy is a nutter. Do not get me wrong however. I am definitely sure: a pro-state Turkish academician like this guy is a more reliable source than David Graeber Am I right libcomers? It's not entirely clear what the purpose of this text is. The title announces critical questions to be answered by the "supporters of the rojava revolution", but the unstructured "and another thing..." nature of the text and the proliferation of questions (20 "? "s appear) without any indication of which are rhetorical and which are critical, make it hard to see that the purpose is genuinely to open a dialogue. Particularly given the "how long has it been since you stopped beating your wife?" nature of many of these questions, such as "So how can lower class Kurdish women break from [Anarchism/Marxism/Feminism/etc] and truly liberate themselves?". Kurrem has attempted to answer some of the questions above, but I'm not convinced of the utility of that exercise, given the usual response to answering a series of "whaddabout..." questions is usually just a further extension of the series of whaddabouts. 1. Is the persistence of tribalism the predominant force in the political decomposition of class politics within Kurdish society? 2. Given the failure of the PKK's "Revolutionary War against Feudalism" as a strategy for destroying tribalism, what would an alternative strategy with more chance of eventual success look like? In relation to the first question, the possible answers are three: Yes, No, Don't know (and don't care). My problem with this text and many of the others like it, is the implicit acceptance of the "don't know, but it doesn't matter" approach. In other words, the belief that questions for class politics can be divorced from any consideration of actual class composition. This is a sort of essentialist "second wave" class politics, which abstracts from the actual social structures traversing the class subject in question, both its technical composition (direct peasant producers, tenant farmers, landlords, wage workers, unemployed, etc, etc), and its historico-political composition (the specific gender relations of tribalism, for e.g.). In my opinion, the impossibility of this kind of abstract "second wave" essentialist class politics to act as a guide for praxis is not limited to the cases of the Kurds or the Zapatistas, but is ultimately just as sterile in more metropolitan contexts as well. In relation to the second question, the failure of the PKK's "Revolutionary War against Feudalism", from 1978 onwards, which ultimately saw them being drawn into the systemically reproductive processes of inter-tribal conflict, stemmed from their initial paucity of class analysis which assumed that tribalism had simply been subsumed into a feudal opposition between landlords and peasants. While its tempting to ascribe that initial poverty of understanding of the actual class composition of Kurdish society, at least in the rural hinterlands (and bear in mind that a good bulk of today's urban population were originally inhabitants of that hinterland, now driven off the land by the scorch and burn tactics of the Turkish state) to "Stalinism", my point is that the same lack of care for the realities of class composition appears to be being shown by a good many apriorist critiques that would throw up their hands in horror at the accusation of a similarly out-moded politics. It goes without saying that I think the second question is a better guide to investigating the purpose behind the practices of Democratic Autonomy, than the ideological ramblings of Ocalan. Somebody would be interested in translating it in English? Jeff Miley who accompanied David Graeber to Rojava last year has given a very interesting talk here. Miley warns about the 'push for a Kurdish-only language educational system' and the 'spectre of a lurking ethno-nationalism'. He also says that ‘references beyond the Kurdish movement were strikingly absent from the symbols we saw' and that this was ‘likely to alienate non-Kurds’. This PYD/YPG visit to Paris coincided with another leftist charm-offensive to Western Europe - that of Syriza. Like the PYD, Syriza wants Western investment to revive a capitalist economy. Both parties also use the threat of ‘fascism’ to encourage Western support. And both parties sometimes make surprisingly radical statements that they will inevitably betray. Syriza’s Finance Minister, the economist Yanis Yaroufakis, has recently even said that ‘I am a libertarian communist or libertarian Marxist’! why you are so manipulative anti-war? what is your agenda? Do not get me wrong I have nothing against having agendas but I really want to know what is your motivation? And do not be effected by his\her ( I mean anti_war not the speaker) manipulative quotes (the full of which can be heart around minute 37 and discussion of non_national and anti_state politics of kurdish movement throughout the clip) and one sided representation of Rojava. Any differences I might have with 'Anti War' aside I would say that their 'agenda' is clearly anti-capitalist. And what is Dr Jeff Miley's 'agenda' or are we just to take it that he is some kind of 'nuetral academic'? He makes a case, as others have, for the 'democratic credentials' of the Rojava social movement and offers some critical support for the non-patriachal, non-ethnically based ideology (if not entirely the practice) of the still Kurdish based political/military organisations, but non of this is sufficient to deny it as an essentially national movement aiming for a modern democratic mini-state amongst the array of political structures that seek to manage their affairs within the framework of global capitalism. If this were to provide a breathing space for the emmergence of an independent and internationalist class based struggle amongst Kurdish workers accross the region that would be welcome but it could only happen through a rejection of the illusions of 'Revolutionary Kobane' fostered by the PKK and it's supporters. Now I think this is illegitimate counter information production. From when on trickery is considered a form of anti-capitalism? From when on revolutionaries start to not discuss or analyse but just cut up irrelevant articles to look "right"? (just like the article above again written by -guess who?- anti war) I think this attitude perfectly summarizes compensation of inability to do politics with attacking actual political processes by moralist and/or ideological terms. This is to say the very least: unproductive for any sort of politics, including anti-capitalism. Also you get my question related to motivation wrong. It has nothing to with academician I repeatedly ask anti-war for a discussion about his repeated posts. However he never replies back. He always comes back with another article or mini article (in the form of a comment) that mixes already known usa-rojava relation and some new negative issues and decorates the product with lovely pictures. I really wish to know why does he/she do that, don't you? I mean why would anyone post here original stuff if he or she will never reply back to anything? I mean even David Graeber showed up to reply. So I am curious where does this motivation come from? what makes this person so happy about endlessly bashing Rojava with one-sided articles? By the way I am really happy that now at least we reached to a point where we do not need to discuss women issue in Rojava again. Despite all counter info provided (thanks anti-war and others) reality emerges triumph and it appears it will continue to do so as more radical observers and academics go there. Anyway I noticed you made a dangerous "choice" in your formulation of the issue in Rojava. It would be really good if development you mention occurs there, however in what ways we should formulate "the upcoming proletarian revolution" (in Rojava in this case) as opposed to ongoing women's revolution, or collectivisation or development of democratic structures? Why we need to do that?Is it because -let's say- women's emancipation is less significant compared to proletarian revolution? What makes you think women's emancipation in Rojava is compatible with capitalism exactly? (or in general do you think if there is no free reproductive labor will capitalism still be capitalism? 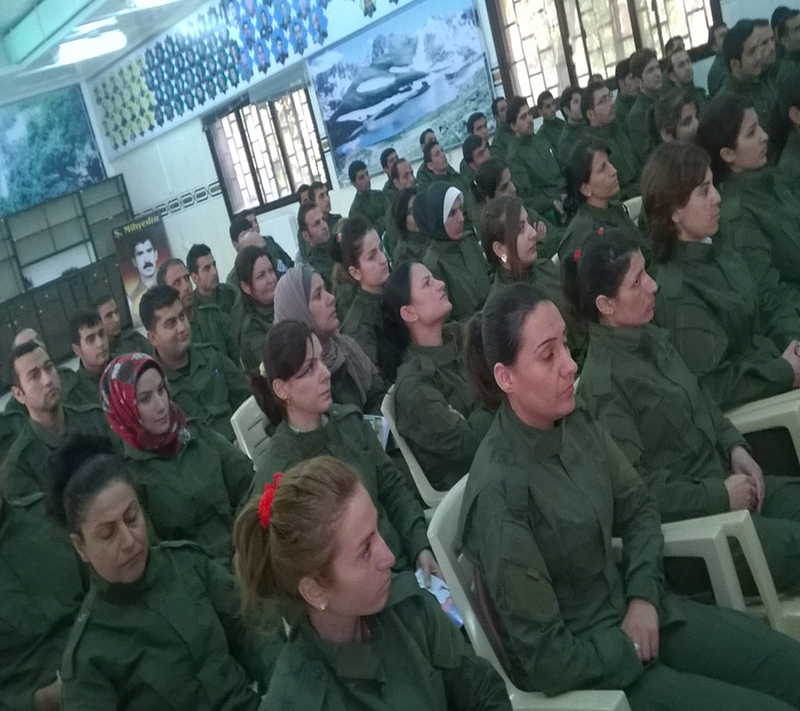 [you know there are some interesting socialist-feminist's who say it won't]) Lastly, in this context how does great anti-capitalist anti-war helps women's revolution going on in Rojava, by waking women from their slumber/illusion (Which seems to translate into reminding the women they are nothing if they are not just part of a class movement) ? By the way I am really happy that now at least we reached to a point where we do not need to discuss women issue in Rojava again. Despite all counter info provided (thanks anti_war and others) reality emerges triumph and it appears it will so as more radical observers and academics go there. Anyway I noticed you made a dangerous "choice" in your formulation of the issue in rojava. It would be really good if development you mention occurs there however in what ways we should formulate the upcoming proleterian revolution as opposed to ongoing women's revolution, or collectivisation or development of democratic structures? Is this because lets say womens revolution is less significant compared to proleterian revolution? what makes you think womens revolution in Rojava is compatible with capitalism exactly? (or in general do you think if there is no free reproductive labor will capitalism be capitalism still?) and in this context how does great anti_capitalist anti_war helps womens revolution going on in rojava? by waking women perhaps from their slumber? Interesting interview with Ayşe Tekağaç of Roj Women about Ezidis living in Newroz Camp (North Syria) where they conducted interviews with the Humanitarian Emergency Settings Perceived Needs Scale (HESPER) method. Definitely seems to be a cultural difference in patriarchy between the Ezidi community and the PYD. The members of the women’s organisations raised serious concerns for the displaced Ezidi women. It was indicated that honour-based traditions and religious rules regarding virginity and marriage are practiced; and women rescued from the attacks/ kidnapping, risk suicide, and societal isolation when they return. For example, it would not be generally acceptable for women/ girls to travel away from their families and due to this, women’s organisations had plans to bring training within the campsites. A large majority of the Ezidi community said safety was not a problem where they are now under the protection of YPG/YPJ. We were told that some young Ezidi women have joined the ranks of YPJ after the attacks and these numbers have increased since. Some Ezidi women and girls have chosen to remain with YPJ -Women’s Protection Unit, and had called their families to say to ‘forget’ them and that they have joined armed resistance. The masses have a mixed consciousness. Well perhaps there is a change women's struggle might blossom among Ezidi women following the kurdish YPJ (and women's councils and laws in general). Is it not plain to see that women can and do carve out some areas of freedom to their advantage within modern capitalism compared to previous societies or earlier forms of capitalism (including the remnants of such in todays world) but which can also over time be incorporated to the benefit and further development of capitalism as well. Of course I am supportive of these efforts (where they are not tied to any specific capitalist class interests) whether in Rojava or anywhere else in the world but a womens revolution as such cannot be seperated from a proletarian revolution for communism ( to put it another way womens emanicipation can only truly be secure as part of human emanicipation and the creation of a world human community). Please don't make assumptions about 'my agenda' ! I asked you a question that I think points to a certain tendency in your arguments that is all. (I am totally fine with agendas by the way ) However as you might have skipped unintentionally, I will explain it again. The question was not the necessity of unity of women's and worker's movements to make a true communist revolution (I totally agree on it with you) The question is what is the basis to "prefer" worker or women for development of a post-capitalist society (as you repeatedly imply women's issue is doomed to failure without an independent worker's movement in Rojava). As it was argued in socialist feminist circles capitalism equally depends on reproduction of productive forces of society by minimal cost. As Graeber for example reports there is an active and big union of housewifes (?) in Rojava. So analytically speaking 1)what separates women's movement form labor movement? 2)Why women can not initiate other movements possibly facilitating a social transformation, why can't women be first? My point is: I wanna see what will they accomplish as an organized labor force of women (whether it is pro or against PYD) to shape post-war Rojava social structure (also this issue could be formulated in ecological or democratic terms all of which emphasized by democratic autonomy project) However seeing it -I think- depends on showing political solidarity (or at least not criticizing those who "support" on this basis) with those people whether or not you like Ocalan, democratic autonomy, Bookchin, PYD or YPG. I think such approach offers much more potential for any future anti-capitalism than writing half informed pieces based on 1) just negative facts [it is you Anti-war] 2) romantic calls for the true beliefs of anarchism that has zero empirical content and reflexive thinking [this is Dauvé]. Anyway I think it would be really good to remember that, following Deleuze, we should never forget to fight against reproduction of Doxa and/or opinion even in our own "radical circles". Because it is poisonous to development of real thought (in the sense of new ideas and approaches) which is the only possible way to engage with political and social realities of our time and place. (whether it is pro or against PYD) to shape post-war Rojava social structure (also this issue could be formulated in ecological or democratic terms all of which emphasized by democratic autonomy project) However seeing it -I think- depends on showing political solidarity (or at least not criticizing those who "support" on this basis) with those people whether or not you like Ocalan, democratic autonomy, Bookchin, PYD or YPG. Is there a group that is against the PYD from the left in Rojava? I'm sure their are individuals and even groups that are to the left of either the PYD theory or practice in Rojava, but I'm hard pressed to think of a formation that is against them from the left (more anti-capitalist, more anti-statist, more anti-authoritarian, more pro-communism) at this moment. I'm sure there are individuals and groups operating inside (or outside) of Tev-Dam that are to the left, but they want to see Tev-Dam succeed and become even more radical. Just as I'm sure there are folks in the PYD/YPG/YPJ that are more to the left of the organizations. Just as I'm sure there are folks in Tev-Dam and/or the PYD that are more to the right of the organizations and want to see them succeed, but implement a less radical program. Devrimci Anarşist Faaliyet (DAF) while to the left of PYD and independent of the PYD is certainly and materially supportive of what the PYD is trying to accomplish in Rojava. Is there some group to the left of the PYD that is against the PYD in Rojava? Or is everyone actually to the left and actively against the PYD currently outside of Rojava? Just to be clear - There are and have been various 'womens movements' and various different and seperate 'labour movements' historically, largely institutionalised as representative forms within capitalism, but an independent working class movement against capitalism and at least potentially for communism is exactly that - a movement of men and women that surpasses such seperate 'movements' and which cannot be constrained within a territorial limit. We clearly differ in our assessment of the possibility of such arising out of the current situation in Rojava in terms of both the dominant internal and external forces at work. Spikymike, yeah ok let's leave this here. an independent working class movement against capitalism and at least potentially for communism is exactly that - a movement of men and women that surpasses such seperate 'movements' and which cannot be constrained within a territorial limit. So, we are talking about a hypothetical independent working class movement against capitalism that isn't constrained within a territorial limit, as compared to the actual socialist(can we atleast say "socialist"?) movement that isn't constrained within the territorial limit of just one country--but rather four. Especially important part of what you emphasized is that: PYD and its base is really complex and consists of different sorts of people and groups. This is something they need to consider - and to some extend manage, maybe- if they wish to realize their political, social and economical programmes (which I hope so). I think of the Yezidi of Sinjar. Roj Women has documented their cultural patriarchy and I think its safe to say that PYD/PKK was to the left of a lot of the folks in Sinjar. Kind of impossible to talk about class relationships when Sinjar city is in the hands of the Daesh and the majority of the Yezidi are either in a PKK/PYD protected refugee camp or part of the PKK/PYD force trying to take back Sinjar city. But we can talk about how the PKK/PYD is influencing the treatment of women among the Sinjar Yezidi... and it seems like its going in a positive direction. I'm not clear if you are asking a genuine question of my last post or making a statement of your own. My wording there was specifically a response to the particular matters raised by kurrem earlier regarding my understanding of the relation between class and womens movements and is frankly just the tail end of a series of discussions/disagreements I have had with kurrem and Marx-Trek on several other related threads on this site around the theme of 'socialist enclaves', 'socialism in one country' and a number of other themes. So apologies but I'm not inclined to go over all those arguments again from scratch - suffice to say I'm more with Dauve's communist approach than against him on these issues.